It’s Incredible. If you’re gonna call your seasoning “It’s INCREDIBLE”, then you’ve got a ton of confidence in your product. But does this seasoning live up to it’s name? Let’s find out… from the Houston, TX area, we have It’s Incredible Seasoning from Heaven Made Products. Heaven Made Products is run by Michael Pitre, a native of Louisiana. He got his start in 1990 when he first moved to Texas and helping someone with a “Cajun deep-fried turkey” injected with Italian dressing. This blasphemy led Pitre on a quest to come up with a true Cajun deep-fried turkey. This, in turn, led to an adventure in trying to find the perfect injection and seasoning. His story is a very detailed story that I’d encourage everyone to read. The ultimate result of all his work is a line of seasonings and injectable marinades with a Cajun influence that are set to become a presence in the market! The line of rubs and seasonings are gluten free, MSG free, and low in overall salt content. It’s very rare that I’ve found a rub that has worked no matter what food I use it on. This stuff has. From stir fried vegetables to pork chops to popcorn to French fries, It’s Incredible has been… well, incredible! 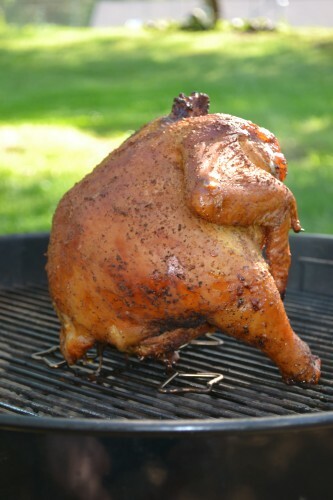 It even works on foods that need a little longer cook time, such as this whole chicken vertically roasted on the Weber kettle. I’ve been extremely pleased with it, and it has become my go-to all-purpose seasoning. I highly recommend this product. The only negative I could find in this is that the ingredient list is a bit long and is not 100% organic/all-natural. But wow is this stuff tasty! 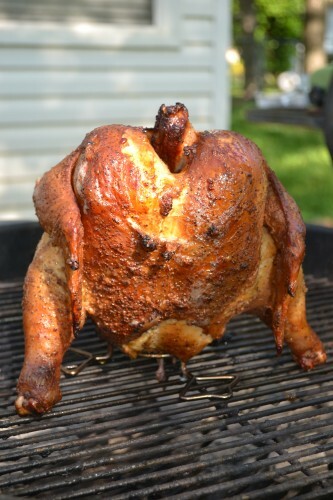 That is one good looking beer can chicken. The color is beautiful. I read the ingredient list and found a very interesting item: dehydrated chicken meat. I would like to try it. If I ever see it out here on the West Coast I will pick some up. Great Review! Thanks! Luckily no beer was harmed in the making of that chicken. You can order online at: http://www.HeavenMadeProducts.com I can ship up to 7-8oz bottles for only $5.95, 4-16oz bottles for same shipping and 2-32oz bottles for same shipping cost. It might be years before we get to California. You will not be disappointed with our products, they are all full of flavor and not full of raw salt. TRIED IT ON THE HAMBURGERS YESTERDAY,MIXED 11/2 TEASPOONS IN THE MEAT. MADE DE BEST HAMBURGERS. DIDNT NEED SALT OR PEPPER. Yes, it’s true. 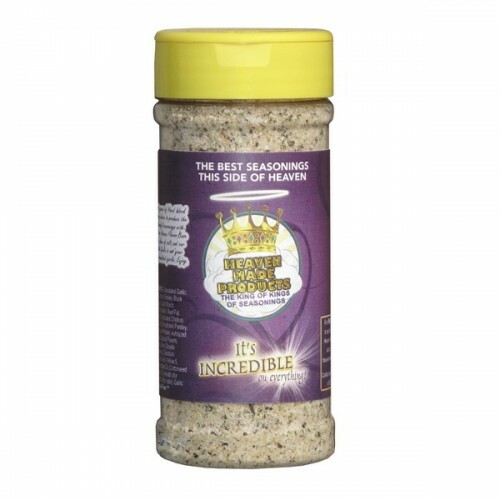 Incredible is a delicious all-purpose seasoning, even on popcorn. Michael, is a contributor for StoryQue, our monthly barbecue magazine. The story and personality behind these products is great. And the seasonings are amazin! BAKED CHICKEN YESTERDAY, GRILL POAK STEAKS DAY BEFORE, HAMBURGERS DAY BEFORE THAT. IT ALL TURN OUT WONDERFUL. I just found out about this site and is just what I was looking for, right of the bat I’m buying 2 bottles of this condiment that they say it goes well with every meal.